I’m not going to say much about this photo, other than that I feel like the eye contact made between this silver back and young gorilla is pretty powerful. You might recognize this gorilla. It’s featured in a previous post in a very similar photo (Chomp,Chomp,Chomp,Chomp). I couldn’t decide which one I liked more so I processed both of them. Let me know which one you like more in the comments section. If you follow me regularly you’ll know that I had pretty much all of my camera gear stolen in Italy. If not, you can get the details here. I’ve now got an insurance check in hand and am trying to figure out what to buy. It’s a bit weird starting from scratch. I was dead set on buying the new 5d mk iii, but now I’ve looked at it I can get a used 5d mk ii and 7d for less than the cost of a mk iii. So, I’ve decided it’s not worth it. The two cameras compliment each other well, and the improvements I was interested in from the mk iii are covered by the 7d. Plus, if I accidentally drop one off a waterfall I’ll have a backup camera with me. With that decided I have to figure out what to get as far as lenses. I will be getting L-series lenses and had hoped to get them used from BH Photovideo to stretch the insurance cash as far as possible. Unfortunately, there aren’t many used L-series lenses available at the moment. So far, I’m confident I’ll be buying another 14mm prime lens and a 24mm-70mm lens, though it’s looking like I’ll have to buy the new version of the lens I had, at a premium as it’s just been released. My big dilemma is with the longer lens. I had a 70-300mm lens, but now I’m considering switching that for a faster 70-200mm lens. That would allow me to really freeze motion, but I’m reluctant to lose the reach. So I think I’ll be buying an extender as well, which will effectively extend my reach to 400mm. I just hope I don’t get too disappointed by the drop in performance and image quality the extender causes. Today’s photo was taken using my old 70-300mm lens. It, combined with the big, full frame sensor in the 5d mk ii, allowed me to get a nice tight photo of this guy, and then crop in even closer for a portrait. This little guy passed by me clinging to his mother’s back and seemed particularly interested in my camera. When she stopped and sat down he was behind her, but he crawled round to this spot and continued to watch. This guy has featured in a few of my previous photos. 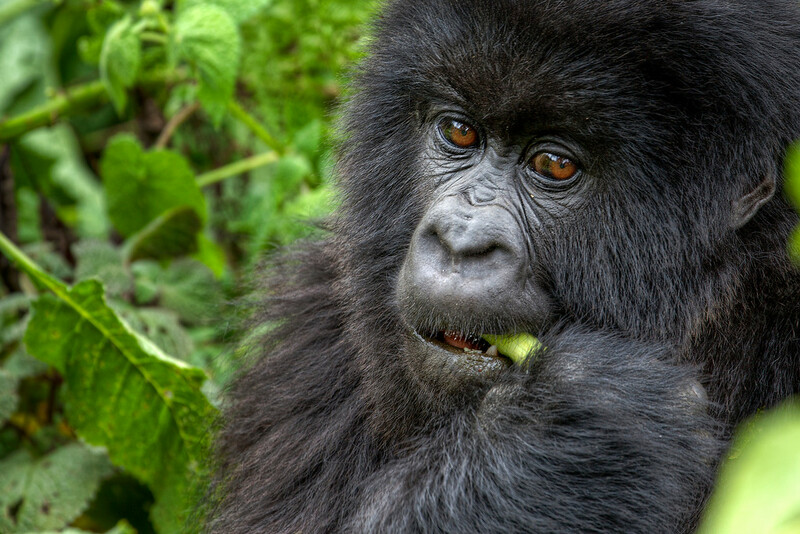 Click the “mountain gorillas” category to see a few of his different emotions… including grumpy, really, really grumpy. 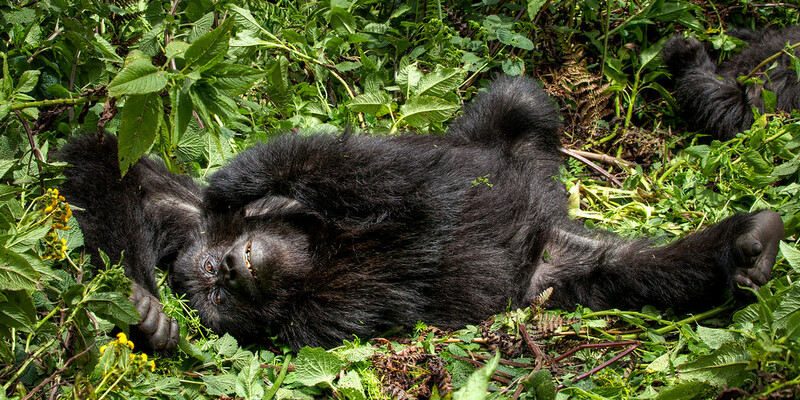 I’ve got a LOT of gorilla photos and I’m struggling to think of what more to say about them. 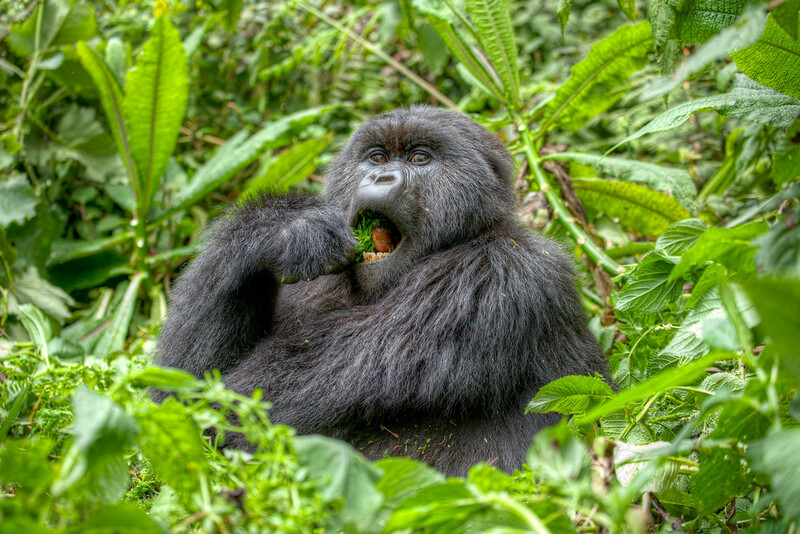 If you want to know more about my experience with the gorillas in Rwanda click on the “Mountain Gorillas” in the categories to see all of my gorilla posts. A friend sent me a note today to let me know that one of my pictures has been featured in an article on My Modern Met about the Niagara Falls’ Stunning Festival of Rainbow Lights by Katie Hosmer. I love it when my photos appear on people’s websites. I normally spot them when people start linking into Traverse Earth or Flickr from the article. I think I like it even more when I hear it from people that have recognized one of my shots! So, if you spot anymore of my photos about the web, let me know! There’s no prize, but I’ll definitely say thanks. Also, I’ve had a number of people point out that my photos can be copied from this website, or on Flickr, or on Smugmug. That’s okay with me. My images are all available under a Creative Commons Attribution-NonCommercial 3.0 Unported License.. That sounds complicated but all it means is if you’d like to use one of my images for a non-commercial purpose that’s fine. Just link back to me. I prefer a link back to my homepage, www.traverseearth.com, but a lot of my images that end up being used out on the web are found on Flickr and typically link back to there. So, want to illustrate a point on your blog? Go right ahead. Want to use a photo for your cover photo on Facebook? Fine by me. Just remember to point a link back to where you found it! If you’d like to know more on Creative Commons, feel free to go ahead and click the link above and explore that site. 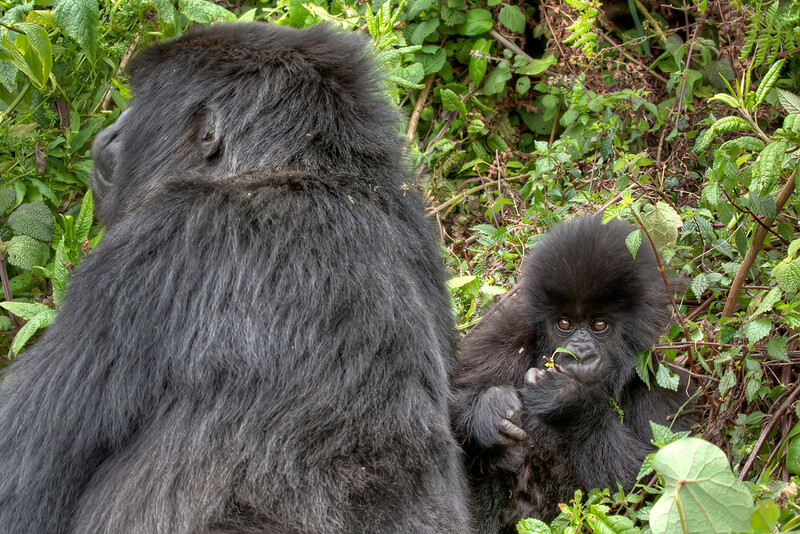 When visiting the mountain gorillas in Rwanda one conclusion is really easy to draw. 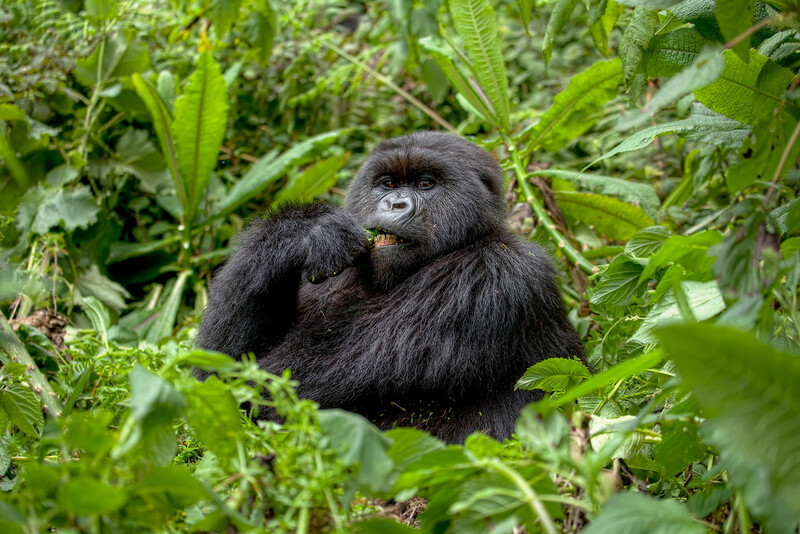 Silverback gorillas are truly formidable. All the other gorillas seem intrigued by your presence. They pause to watch you as they go about their daily routines. 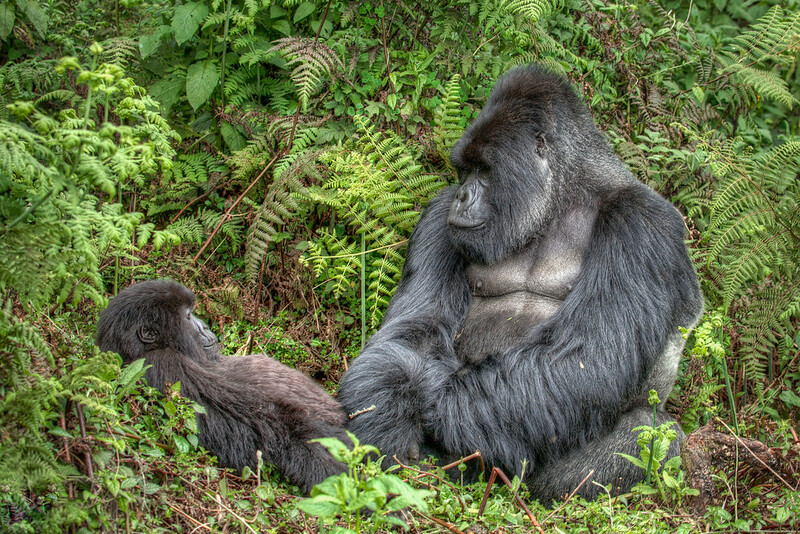 The silverbacks, on the other hand, just seem grouchy. They don’t pay you much mind but maintain this look like they could snap at any moment. 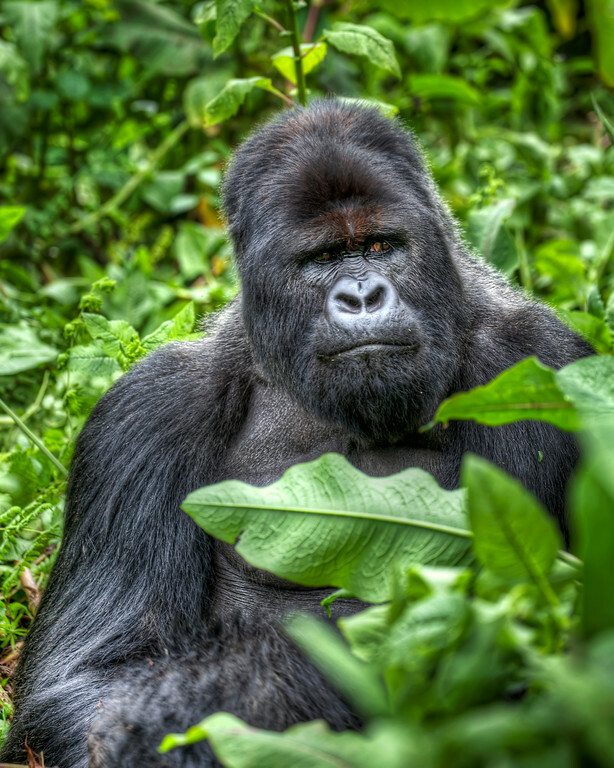 I got the pleasure of watching one charge through the bush and slap another gorilla out of the way. I thought it was incredible. 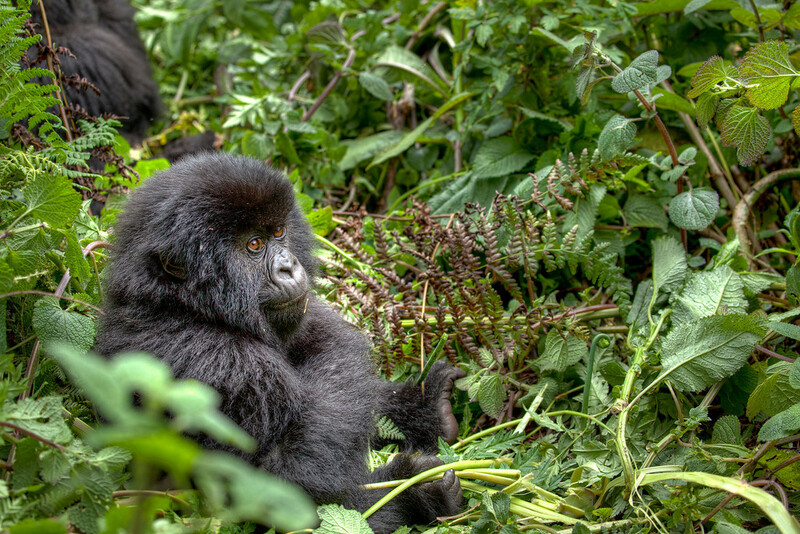 Cameron and Chris had a different viewpoint; they were the focus of this gorillas mock charge. Chris happened to film a video of this on his iPhone as it careened through the bushes at him at great pace. Somehow that video disappeared before I got a chance to see it. I’ve got a theory that it’s because you could hear a whimper of fear or two in the background. Chris did admit that when he played the video back it was clear that his hands were shaking during the ordeal. This photo was taken later, at a much calmer moment. I’m not sure if this was the same gorilla or not. He doesn’t look particularly happy with our presence there. Maybe someone had just accidentally stood on a particularly tasty plant. Originally, when I was working up these gorilla shots, I was combining three exposures and using the ghosting tool in Photomatix to deal with the subjects movement. I was happy with the results at the time, but looking back I’m not so thrilled. Now I am using one RAW exposure. In Photoshop’s Camera RAW I adjust this exposure to simulate varying exposure levels and produce three images ranging from -2 stops through to +2 stops. This is resulting in much crisper images with far less artifacts. It also takes a lot less time. Okay, I’m really bad at naming photos. I used to agonize over what to call them. I’ve decided to just go with the first thing that comes to mind when I look at them. Unfortunately, on my first application of this rule the only thing I could think was, “Chomp, Chomp, Chomp, Chomp”. Not a great start. This new photo naming method may just confirm that I have the mind of a child. I’ve also come to the conclusion that I’ve got a LOT of gorilla shots and am starting to run out of things to say about them. 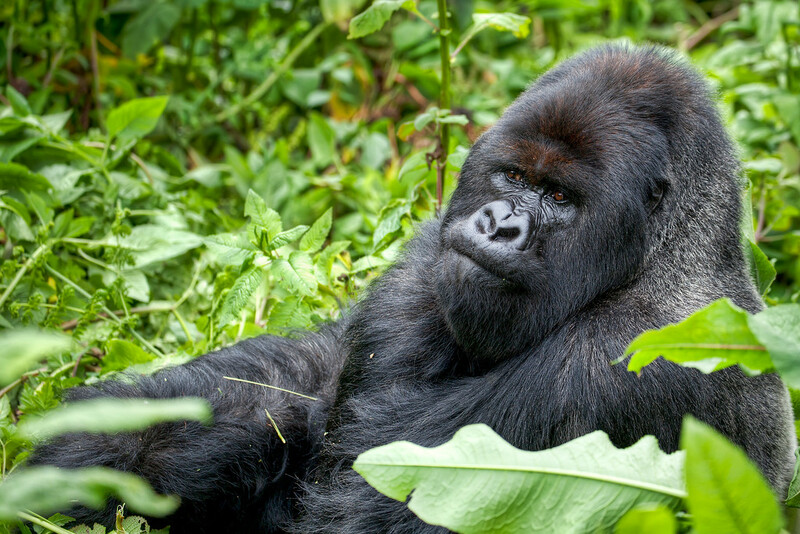 So, if you want to know more about my take on these incredible animals, and see more photos, click on the “Mountain Gorillas” category. How do you guys go about naming your photos? I’m back home from Iceland now so can get back to my daily photo posting. It was difficult to get them done while in Iceland as any time that I wasn’t desperate for a few hours sleep I was out exploring. I’m looking forward to processing and posting the photos I took there. 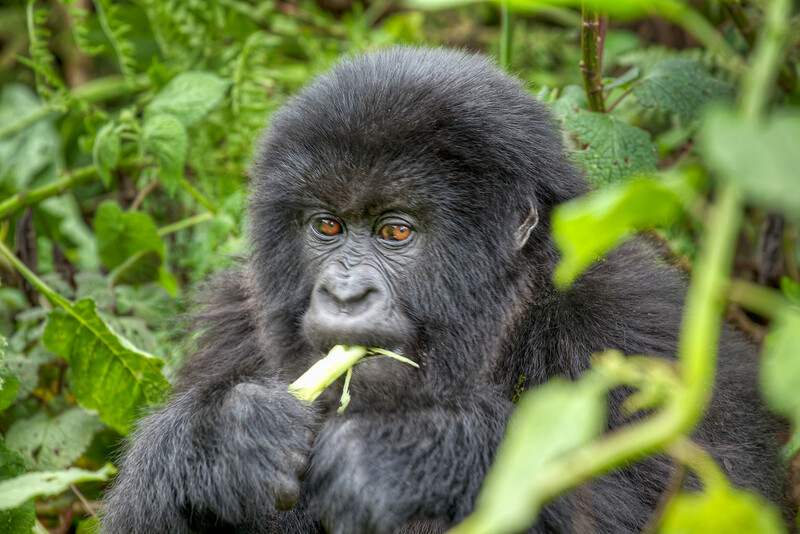 That being said, I’m still pretty worn out so you get a quick post today and a photo of a really cute, fuzzy Gorilla. Where in Iceland is Johnny (hopefully)? I’ve written these posts in advance so can’t tell you where I actually am. I can tell you where I hope to be, if everything goes to plan. There’s actually not much to report today. I arrive at Keflavik Airport at 11:50pm. Fortunately, my travel buddy will be getting in a day ahead of me so I’ll have a bed all ready for me. But, I expect I won’t be able to resist a first photo session under the midnight sun. Who could be scared of this guy?